Using the best grade material, we are successfully manufacturing, exporting & supplying a wide gamut of Manual Incense Stick Making Machine. The offered product is stringently examined under the supervision of our skilled professionals against the exquisite parameters of quality to ensure hassle free range to our clients. 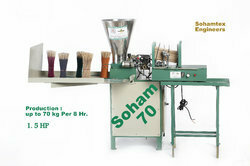 In order to this, offered machines are highly demanded in the market for its sturdy design and industry proven finish. Our client can avail these machines from us at market leading prices. Meeting the demands of customers as a manufacturer, exporter and supplier, we are engaged in offering Incense Stick Making Machine. 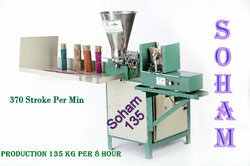 These innovative ranges of machines are widely demanded in various industries for meeting diverse applications. To maintain industry defined quality standards, the entire range is manufactured using quality proven raw material and cutting-edge technology. Also, the entire range is examined properly by our quality controllers upon distinct parameters of quality. As an esteemed name in the relevant industry, we are offering a precision-engineered array of Agarbatti Incense Stick Making Machine. Following industry defined guidelines, our professionals manufacture the entire range by utilizing contemporary machines, modernize technology and prime grade raw material. In order to ensure quality, these machines are rigorously tested upon a series of parameters. 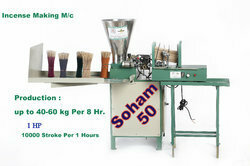 Moreover, clients can avail the offered machines from us at market leading prices within given span of time. 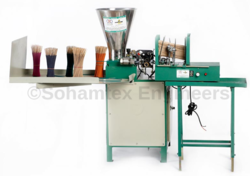 We are a manufacturer, supplier, and exporter of agarbatti incense machine also known as Incense Stick Making Machine, incense machine, agarbatti machine. we can also supply auto feeding system for this machine. We are instrumental in providing our clients with a perfect quality Semi Automatic Incense Stick Making Machine. 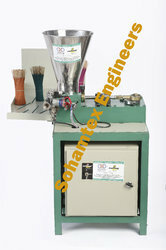 we hold immense expertise in manufacturing, exporting & supplying a broad range of incense stick making machine. our product is manufactured making use of premier-grade raw material and advanced technology at our end. owing to its corrosion resistance as well as superior finish features, the offered product is highly demanded in the market. apart from this, clients can avail the entire range at nominal prices within given span of time. · Machine Speed: 200-225 Stroke/Minute. · Production: 65 to 80 Dry Kg./8 Hrs. · Required Power: 1.5 HP Single Phase.